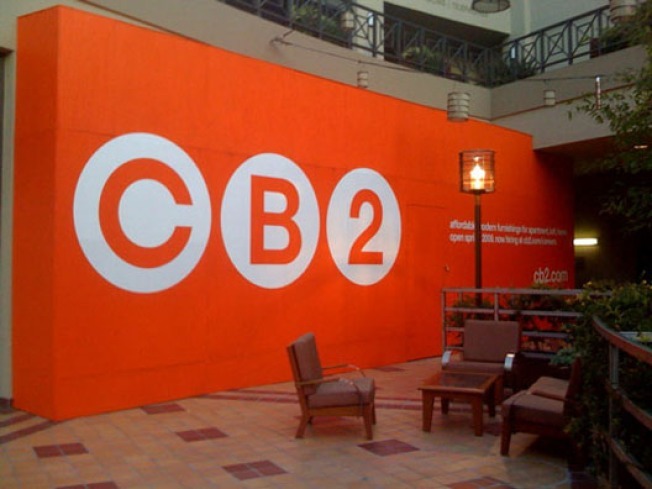 LOS ANGELESRacked LA is fired up about the fact that Crate & Barrel offshoot CB2 is now sporting some serious orange signage at 8000 Sunset. Additionally, Blackburn and Sweetzer revealed that the store will open Thursday, April 30. Racked LA advises that you start measuring the square footage of your rooms. LOS ANGELES: If you missed any of the insanity that was fashion week, here's a list of every single story Racked LA did on the event. Don't miss the shirtless guy in a headress. SANTA MONICA: Stores in Santa Monica may be folding left and right, but Kitson survives: Starting today, the store is opening a pop-up outlet at 1415 Third Street Promenade. The run lasts for the next two weeks. More about the store: "Window decals trumpet 30-70% off gear for men, women and kids, and a peek inside revealed stacks of jeans (Hudson, Denim of Virtue), tees, and, perplexingly, stuffed animals."